When I lived in Paris, I used to walk regularly to a gym near my apartment. One day as I was passing a construction site, something unusual caught my eye. In the middle of the sidewalk sat a temporary street lamp which was anchored by a massive concrete block. 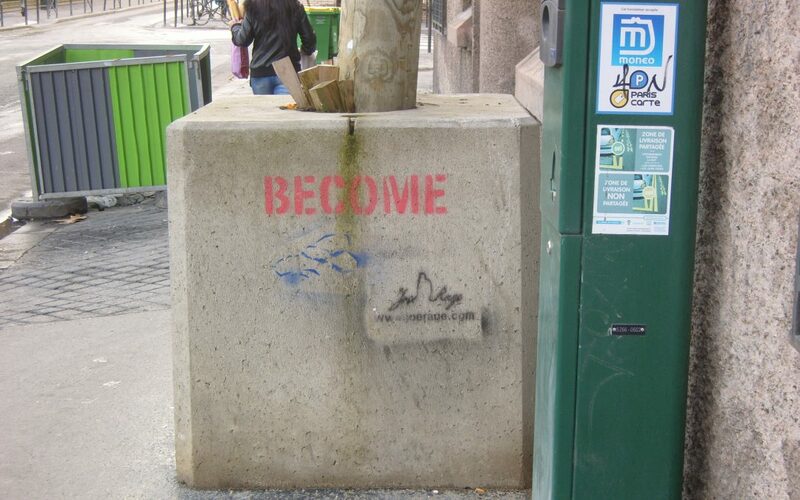 Someone had stenciled this word in red on the block: Become. I never learned who painted this word on a block of concrete or why, but I was amused and intrigued. A few weeks later I was on a different street not too far from the first one and I saw it again, Become, stenciled on another concrete block. Another day, I saw it again, stenciled on the sidewalk. How many were there? Why had someone systematically sprinkled this word across the city of Paris? Had it touched anyone else as it had me? I’ve always been encouraged by the concept that we can become “new and improved”. When I write fiction (and when most writers create characters and their journeys) there are important changes that happen to the characters. If we read a story when there is no change, no growth, no deep realization, it falls flat. We are disappointed. We long for transformation, whether in a fictional character or in ourselves. We were put here not to stagnate, but to develop, and I find that exciting. What areas do you want to grow in? This isn’t a rejection of ourselves as much as a craving to experience more of what we were meant to be, what God wants us to be. It’s a journey, and an exhilarating one, even the dark days. A dark day can be a chance to look at life differently, to choose different emotions. Then as we make those choices, we change. God makes sure of it. That word become provided a smiling invitation to keep up the pace in reaching for more, trusting God for more, and to suspect that dreams can come true. Seeing this word filled me with a bolt of courage and widened my view of what’s possible within myself and my experience, and make this a mindset. You can become…. And just fill in the blank with imagination, perseverance, and faith.